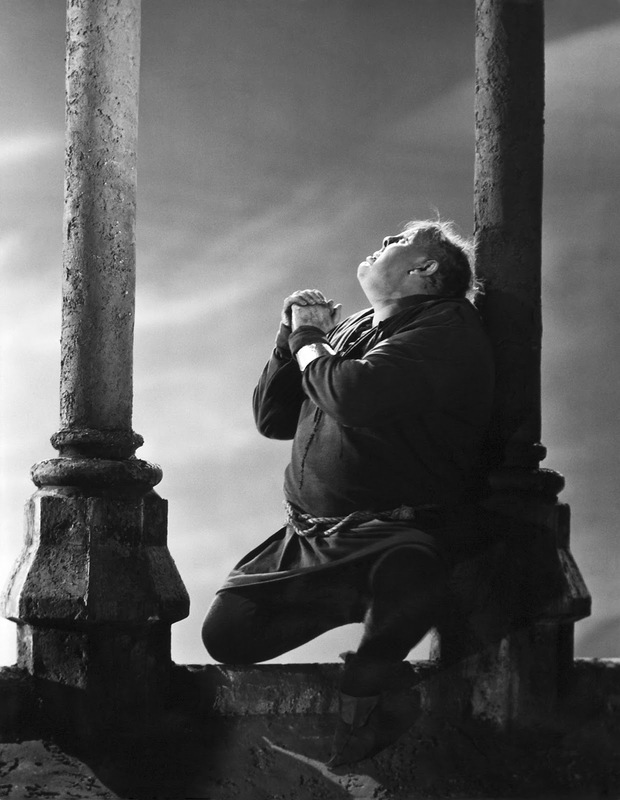 Charles Laughton plays a lonely bell ringer in The Hunchback of Notre Dame. The Stars: Charles Laughton, Maureen O'Hara, and Sir Cedric Hardwicke. Source Material: Victor Hugo's 1831 novel, Notre Dame de Paris. 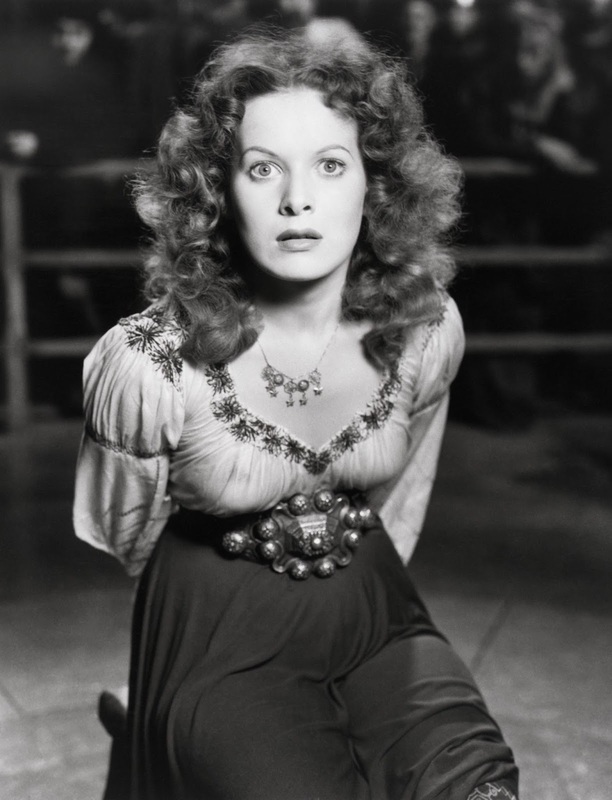 Maureen O'Hara plays the gypsy Esmeralda in The Hunchback of Notre Dame. Awards: Oscar nominations for best sound recording and best musical score. The Plot: The depraved chief justice of 15th century Paris (Hardwicke) becomes obsessed with a beautiful gypsy girl named Esmeralda (O'Hara). He tries to kidnap her with the help of Quasimodo (Laughton), a bell ringer at Notre Dame cathedral who is feared by many people because of his unusual physical appearance. Backstory: There are five silent film versions of The Hunchback of Notre Dame, including the 1923 movie that made Lon Chaney a star. Universal Studios hired John Huston to write a screen treatment for a sound version starring horror icon Boris Karloff, but that project fell through, as did a 1937 MGM movie starring Peter Lorre. RKO producer Pandro Berman finally got the film made in a lavish spectacle that was the most expensive RKO movie to date. Berman always wanted Laughton for Quasimodo, but the talented actor initially balked because he wanted to play Cyrano de Bergerac instead. Berman considered Orson Welles, Robert Morley, and Bela Lugosi before Laughton finally agreed to what would become one of his most memorable screen roles. A French poster for The Hunchback of Notre Dame. Best Performance: Charles Laughton as Quasimodo. 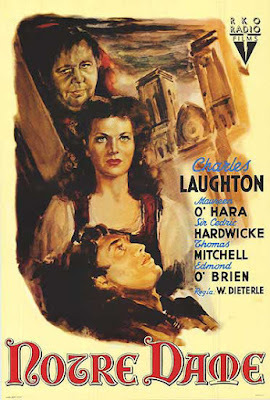 Lon Chaney is, of course, brilliant as Quasimodo, but Laughton's portrayal of the lonely bell ringer is probably the best out of all the screen versions of Hugo's novel. 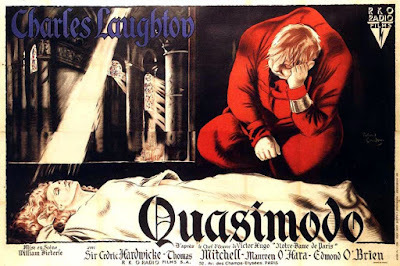 Laughton poured a lot of his own inner turmoil into Quasimodo -- Laughton always felt like an outsider in Hollywood because he wasn't thin and handsome -- but he is also immeasurably helped by Quasimodo's plaintive dialogue. Lines like "I'm as shapeless as the man on the moon" help build the audience's sympathy for a character that would have been viewed as quite abnormal in 1939. Best scene: Esmeralda gives Quasimodo some water while he endures a brutal whipping (clip below). Best Line: "Why was I not made of stone, like thee?" Quasimodo talking to the gargoyle statues. The Set: Berman constructed an elaborate recreation of 15th century Paris at the RKO ranch in the San Fernando valley. The set included and 190-foot replica of Notre Dame Cathedral complete with authentic stone gargoyles, a vaulted ceiling, and stained glass windows. The whole affair cost around $3 million. Cedric Hardwicke plays the villainous Chief Justice Frollo in The Hunchback of Notre Dame. Laughton's makeup: Berman brought in noted makeup artist Perc Westmore to construct the elaborate costume required for Quasimodo. Laughton wore an aluminum and rubber hump on his back and he was extensively padded with rubber to make him appear bulkier. Also, half of his face was covered with rubber, while he wore a contact lens in his other eye. Laughton also plugged his ears so he could simulate Quasimodo's deafness. The makeup took 2 1/2 hours to apply and was quite debilitating for Laughton. His wife, Elsa Lanchester, recalled that he came home many nights in physical pain and with bruises and scars. The Hunchback of Notre Dame was also filmed during an exceptionally hot summer. The heavy costume increased Laughton's core body temperature so much that he slept under wet sheets at night. 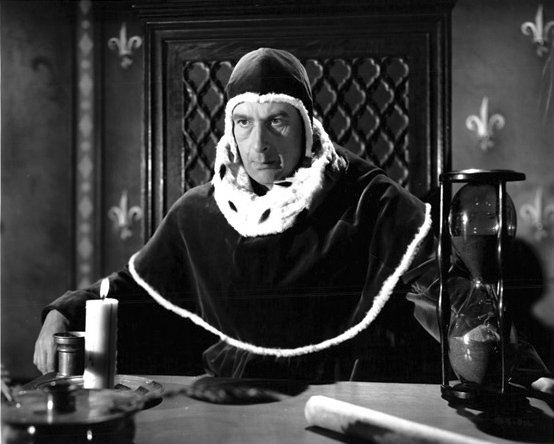 Fun Fact: In Hugo's novel, Hardwicke's character was a priest. That was changed in the movie because the motion picture production code prevented unflattering portrayals of clergy. A vintage poster for The Hunchback of Notre Dame. Why it's essential: Victor Hugo's classic tale has been brought to the screen dozens of times, but the 1939 version still stands as probably the best ever filmed. The film features a great performance from Laughton, several memorable supporting performances, most notably from Edmund O'Brien, and assured direction from William Dieterle. Availability: The Hunchback of Notre Dame is available on Blu-ray, DVD and video on demand.